Today's Alumni Association Leaders face an ever-more demanding community. Value is not only asked for by your alumni, but expected. AlumniMagnet helps you deliver! Who are they? What do they need? What do they like? More importantly: how can you find answers to these questions, and address them accordingly? 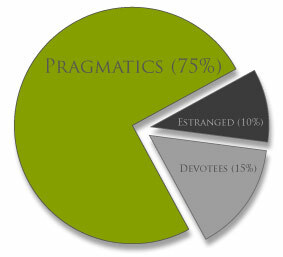 "Pragmatics" - 70 to 80 percent of your alumni. The common theme here is: "what have you done for me lately?" Pragmatics consistently indicate that they feel underserved and for that reason do not engage. This is a huge percentage of your alumni that are all too often not given the attention they deserve. They want to participate and interact--even contribute--but only if they get something in return: Value. 1. Business networking. Whether it is lead-finding, career resources, business advice, or self-promotion opportunities, your alumni are always looking for ways to "put their diploma to work" and advance their careers. In fact, they expect it! 2. Social networking. Some look for a mate, others look for new friends in a new city. Happy-hours, dating opportunities, sports partners, play-dates for their kids, joint activities around a common theme--you name it, chances are some of your alumni are looking for it. Ask yourself: are you providing it? 3. Lifestyle enhancement. Many of your alumni will jump at the opportunity to better their lives. As a major institution, you often have the leverage, resources, and backing to offer a multitude of exclusive and lifestyle-enhancing benefits, perks, and advantages. From group health insurance to travel benefits to financial incentive programs, you can use your organization's clout to deliver incredible value to your alumni. Sounds great, but how much work does it take? Make no mistake: creating an A+ alumni community takes an incredible amount of work. Period. This is where we come in. Our technology was specifically designed with alumni community leaders in mind. AlumniMagnet delivers automation functions, content recycling capabilities, collaboration tools, volunteer recruitment and leveraging components, networking applications, and an amazingly flexible ability to rapidly deploy interest-based subcommunities. With this powerful arsenal at your disposal you will save hundreds of man-hours, increase your team's productivity, enhance your brand, deliver a much wider and deeper value proposition, and--most importantly--welcome your alumni to a next-generation alumni community of their own!